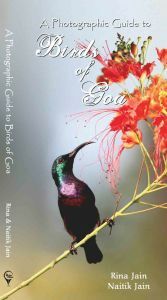 A detailed, informative reference guide to over 140 fascinating bird species of Goa. Rina Jain, a resident of Goa, is a passionate artist. she loves to live with colours as they are the best way of expressing her feelings. After the completion of her studies, she has got a diploma in Dress and Fashion Designing from Mumbai. She has also done a course in art from Nirmala Niketan, Mumbai. Besides being a homemaker, she is also a director in Distilleries, with her husband. Besides this, she aslo deals in handicrafts. Rina loves socialising and enjoys travelling. she has gone on nature and wildlife trips to satisfy her love to adventure. She believes in creativity. Naitik jain, who is seventeen years old, is a class XII student studying in Sharada Mandir Higher Secondary School, Goa. At the age of 11, he had completed a fundamental Course in photography. He has also attended many other courses and workshops in photography. At present, he has a collection of over thirty-five thousand photographs clicked by him. So far, he has bagged ten awards in Goa at State Level and one award at National Level in photography. He is an enthusiastic nature observer and has a passion for wildlife photography. In 2010, he held a solo photography exhibition at Kala Academy Panjim, Goa, of interesting features on place like Porto, Poetugal's Old houses, Spain's Wineries, the Eiffel Tower in France, Big Ben in London, the Pieta in Rome, and many more. In 2012, he had his second solo exhibition titled 'Birds Around Us' at Miramar Residency, Goa, and also released his first book ' A Photographic Guide to Birds of Goa'.